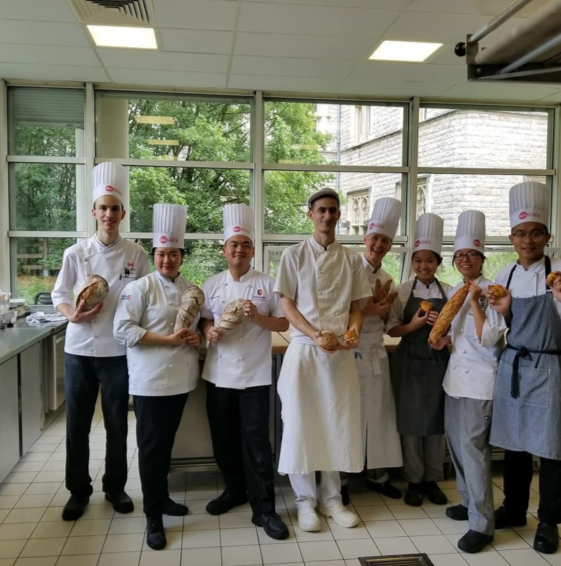 Culinary Management co-op student Chris Bisson has completed a 14-week summer term with the prestigious Institut Paul Bocuse in France. The opportunity is exclusive to students who attend post-secondary institutions included in the Bocuse Worldwide Alliance. Culinary student Chris Bisson, left, spent his summer studying French cuisine at an exclusive program at the Institut Paul Bocuse. Conestoga is the only Canadian member of the alliance. Founded in 2004, it connects institutions that share educational values and the common goal of promoting and developing the professions of culinary arts and hotel and restaurant management. The alliance’s 17 member institutions represent the world’s top hospitality management and culinary arts schools. The summer program runs from May to August and enables students to improve their culinary skills and techniques, acquire knowledge of French gastronomy and learn from each other about their own cultures and customs. Throughout the program students immersed themselves in practical lessons in cookery, pastry and bread making techniques, restaurant service, and theory focused on French gastronomic history. Class visits to farms and wineries were included in the curriculum and students also had the opportunity to share and learn about each other’s unique culinary cultures. A culinary career wasn’t on the horizon for Bisson when he left high school. He finished three years of an engineering program before realizing through a part-time job that he was more interested in kitchens and customers. He received financial assistance for the study term through the Going Global award. Funded by the Employer and Regional Partnerships stream of the Career Ready Fund offered through the Ministry of Advanced Education and Skills Development, the award supports students pursuing out-of-country co-op experiences. Bisson also received the Les Marmitons - Waterloo Region Paul Bocuse Scholoarship, presented with the support of the Cloverleaf Foundation. Bisson will return to classes this fall at Conestoga’s Waterloo campus and looks forward to working in the new culinary facilities. An expanded Culinary & Hospitality Institute will house state-of-the-art culinary skills labs and a new full-service campus restaurant. The institute will provide new programs based on local food heritage and culture as well as applied research and professional development to support local industry. Visit Conestoga’s School of Hospitality & Culinary Arts for more information.